We always have lots of fun on “Making it thru Monday” and last week was no exception! Last week we had a spectacular doily submitted by Arlette of Tying Knots. Arlette is super talented when it comes to making doilies and this one is the ultra, magna, supreme doily of doilies. This project is oval and measures 50″ x 40″ and has over 1.5 miles of thread. I think that’s incredible but also could let my mind really wander on how they figured that out….. You should jump over to her Facebook page and check out all her other great pieces of art. She made her daughter some beautiful wedding gifts such as earrings and garter belt that are so dainty and “girly”. The next project displayed is the beautiful yellow baby outfit designed by Maria from Pattern Paradise. Maria is also exceptionally talented and has done a fantastic job on this package of sweetness. A mother could totally play dress up in this cutie outfit couldn’t she? She sells her patterns on Ravelry and has pages to thumb through. Our last project is the peach colored shawl made by Rachel. This wonderfully made shawl was for her daughter, and I’m quite sure will be a treasured piece until the end of times. There is so much love a mother already has for a daughter and no doubt that much love was poured onto this shawl. Rachel’s daughter is one lucky girl to have a mom that crochets don’t you think? 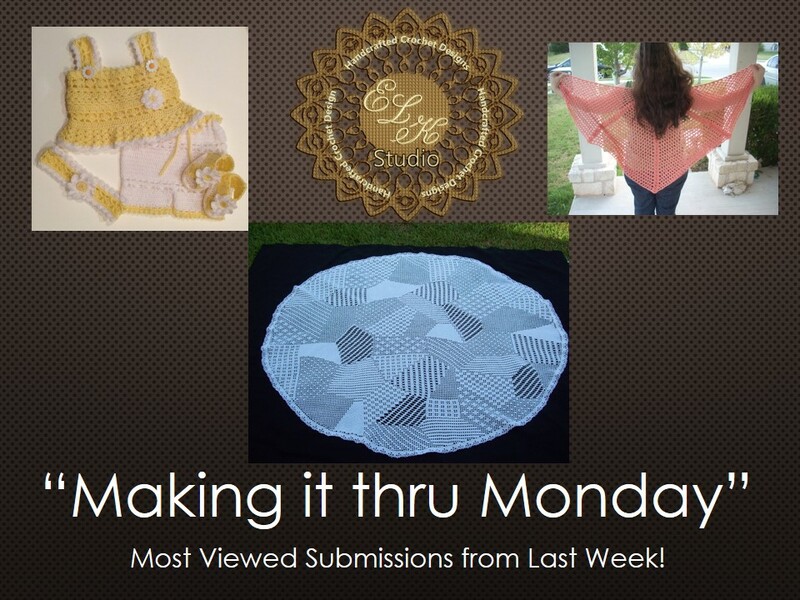 It’s always so much fun to see what people are going to submit on “Making it thru Monday”, and I hope you will jump over to my ELK Studio Facebook page and support these wonderful ladies.